Back to the roots of biking and aventure. It all started from a conversation between two friends, Samuel and Lionel. 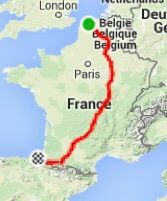 They wanted to organize a small bike trip with friends to challenge themselves: the crossing of France on gravel roads. They reached a couple of friends to find people who would be interested in sharing such an adventure with them and there it happened: a big surprise… Too many people were interested in what was then called the “Ultra CX diagonal”. What first was a private challenge, became a national event. Samuel and Lionel felt it was a great opportunity and switched their cyclist caps to organizer hats.